HomeAN ADDITIONAL CIE SEMINAR ANNOUNCEMENT: CIE Seminar Series 2014 – Are rebounding green sea turtles in Bermuda causing collapse of seagrass meadows? AN ADDITIONAL CIE SEMINAR ANNOUNCEMENT: CIE Seminar Series 2014 – Are rebounding green sea turtles in Bermuda causing collapse of seagrass meadows? ABSTRACT: Large populations of green sea turtles (Chelonia mydas) use the seagrass meadows of the Bermuda platform as developmental habitat. Juvenile turtles arrive in Bermuda from a neritic early life history at ca. 20 cm long (SCL). The juveniles that survive leave Bermuda as sub-adults when they reach a size of ca. 60-70 cm SCL, tag returns and satellite tracking data show that these sub-adults head to adult habitats in the greater Caribbean and Gulf of Mexico region. Recent declines in the extent of seagrass beds in Bermuda, as well as a perception of increases in populations of sea turtles, led to the hypothesis that overgrazing by sea turtles may be contributing to this decline. Stable isotope composition (d13C and d15N) of skin samples from a large sampling of turtles (n =162) as well as the isotopic composition of potential turtle food items shows that the turtles become increasingly dependent on seagrasses for food as they mature. There was a marked spatial pattern in the d15N of the seagrasses on which the turtles feed (d15N of seagrasses, -9.3 to 8.6 ‰, n = 380), suggesting that the d15N of turtles could be used to assess site fidelity in the older turtles. The smallest turtles showed dependence on a planktonic and animal-based food web. 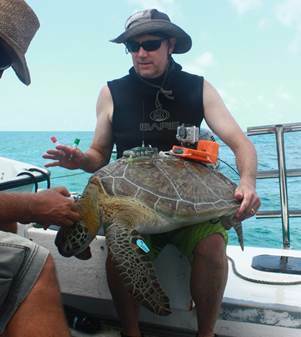 GPS-enabled satellite tags show that the larger sub-adult turtles have very restricted home ranges; they travel only about 1km from an identifiable home refuge to one or more feeding areas over the course of many months, concentrating grazing on seagrasses by individuals to very restricted areas. We show that excluding turtles from declining seagrass meadows halts seagrass decline; heavily grazed seagrass meadow return to baseline values of seagrass leaf width, length, shoot density and productivity within a year of the exclusion of the grazers. Our results indicate that successful conservation of sea turtles in the Caribbean region could have unintended consequences in this important sea turtle developmental habitat. BIO: Jim Fourqurean is a marine and estuarine ecologist with a special interest in benthic plant communities, food webs, and nutrient biogeochemistry. He studied at the Department of Environmental Sciences at the University of Virginia, where he became familiar with the temperate ecosystems, but he developed a love of tropical ecosystems while doing his dissertation research in Florida Bay. He has published over 100 papers in the refereed scientific literature, spanning many ecosystems, from planktonic systems to mangrove forests. In particular, he has specialized in the application of elemental and stable isotopic composition of organisms as indicators of ecosystem processes. He is an expert in carbon storage and fluxes in coastal ecosystems, and the importance of these ecosystems to climate regulation and mitigation. In this role, he serves on both the Science and Policy Working Groups of the International Blue Carbon Initiative. He is also an expert on the impacts of energy exploration and oils spills on tropical coastal ecosystems. While working on the Water Quality Protection Program for the Florida Keys National Marine Sanctuary, has made contributions to the science and application of monitoring in Marine Protected Areas. For the past decade, his main research areas have been in Florida Bay and the back-reef environments of the Florida Keys, but he has also worked around the Gulf of Mexico, in Mexico, Panama and Bermuda, the western Mediterranean and Australia. He is currently a professor in the Department of Biological Sciences, Director of the Marine Research and Education Initiative, and a member of the Southeast Environmental Research Center at Florida International University in Miami, Florida. For enquiries and appointments with the guest speaker, please email Peter Macreadie.